March 2019 issue on sale now! | What Hi-Fi? So, 8K is finally here – or more accurately, 8K TVs are here. It’s potentially a stunning upgrade on the already impressive 4K broadcasts, but is now the time to consider investing in an 8K television set? That’s the question we’re asking in the March issue of What Hi-Fi?, available on the newsstands today. To test the benefits of the higher resolution, we compare two identical sized Samsung TV sets – one 4K and one 8K. But with no 8K content to view, what conclusions did we reach? Even in the fast-moving world of television, the past decade has seen ever-higher numbers for screen sizes and resolutions, the latest of which is 7680 x 4320, also known as 8K. With 8K sets now in the shops, the question is, how do they compare to a 4K TV? To test this, we pitch two 65in Samsung TVs against each other – the 4K QE65Q9FN and the 8K QE65Q900R – to find out which is the better buy. Our review team was out in force at CES 2019 in Las Vegas, looking for the next big thing in TV tech, including a rollable LG OLED TV, a new Sony 8K TV and Samsung’s Micro LED technology. Find out which models we rated as the ‘TV Titans of CES 2019’. You can also read our thoughts on motion processing. It appears Tom Cruise isn’t a fan, but should you switch it off completely? Read the March issue of What Hi-Fi? to find out our opinion. The March issue isn’t just about televisions, we also review the ten best pairs of speakers for under £500 in our round-up. With brands such as KEF, Fyne, Q Acoustics, Ruark and Dali, there’s something here for everyone. If you're currently in the market for a pair of speakers, don’t miss our special feature on choosing between standmounters or floorstanders. It’s one of the first questions to need to consider, and hopefully our advice will help point you in the right direction. And if you are into home cinema, there's a 4K projector round-up. With three models from Optoma, Vivitek and Epson on review, all for under £2000, now could be a good time to supersize your home cinema experience. Speaking of cinema, we've been enjoying the UK’s first Dolby Cinema which has recently opened in London’s Leicester Square. Read the March issue of What Hi-Fi? to find out how we rate the experience. In our Temptations section, we review Cambridge Audio’s Edge NQ, a network streamer and pre-amplifier, which we say is a “feat of determination as much as engineering”. We also review the Parasound HINT 6 stereo amplifier. In total that’s nearly £7,000 worth of high-end kit to lust after, so count your pennies and pick up the March issue of What Hi-Fi? to read our verdict. In our First Tests section, you’ll find reviews of all the latest hi-fi kit from televisions to turntables. Our main review features the B&W 606 speakers, which we think may be “the new speakers to beat”. We also review the Dali Oberon 5s and the Dynaudio Xeo 10 active speakers, plus the Klipsch Reference Base 2018 speaker package – not forgetting the Atlas Equator 2.0 speaker cable. Elsewhere, we review Philips' 55OLED903 TV, the Amazon Fire HD 8 tablet, and AKG's N700NC noise-cancelling headphones. We've also managed to grab some hands-on time with the Technics SL-1200/SL-1210 MK7 turntable – a new version of an iconic classic favoured by DJs. Grab a copy of the mag for our first impressions. Also, don’t miss your chance to get your hands on a free Audioquest Golden Gate interconnect cable (worth £60) when you subscribe to What Hi-Fi? 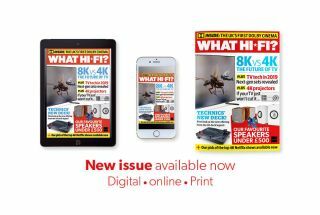 The March issue is not to be missed, so grab your copy of What Hi-Fi? on sale today, or download it to your tablet or smartphone instead.